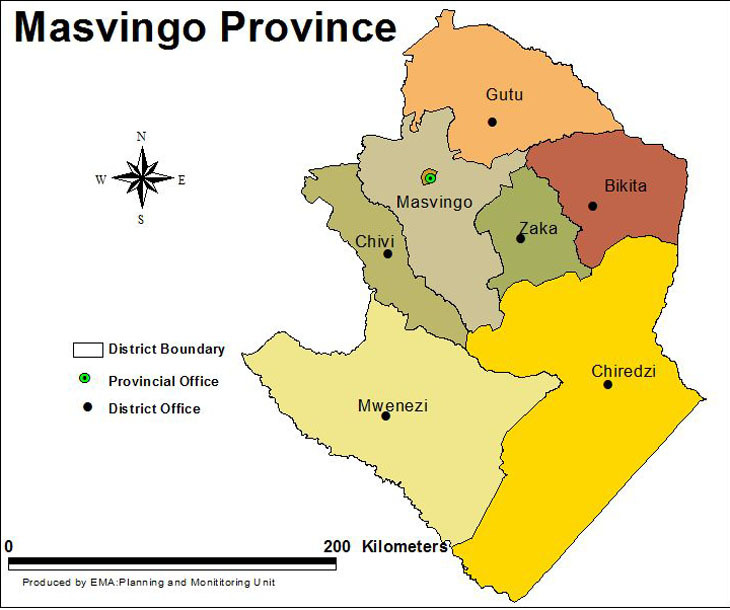 Masvingo Province is located in the south east part of Zimbabwe and comprises of eight districts namely; Masvingo, Gutu, Chivi, Mwenezi, Chiredzi, Zaka and Bikita. Masvingo province is located in the lowveld of Zimbabwe. It has minimal rainfall patterns. Large part of the province is drought prone for example Region 5. Most parts are unfit for agriculture, apart from cattle ranching. The soils in the region are fersiallitic type. The terrain in the district ranges from moderate to steep slopes. In areas where slopes are high, soils are shallow and are of poor texture, the potential for erosion hazards exist. Pollution (water)-such as in Shagashe river, resulting in water hyacinth problems. Land pollution-litter in Masvingo town and all growth points in the district.